The main image on this card is made using the split negative technique. I've seen cards made using this technique, but never had the courage to try it out. Hurdles are made to be jumped, so I jumped, I think it turned out pretty good. It's always fun to try something new and it turn out looking good. Hop over to "Just Us Girls" Challenge and create something outside your comfort zone. I used the sketch from Tuesday Morning Sketches, but discovered I have missed the deadline, but I'll give a clickable link here because you might want to check out Melissa's challenge blog she's got some good sketches. Next week I'll have to make sure I get done a day earlier. And as usual I can't seem to make a heart card without putting this eyelash yarn on it. I'm not really a frou frou girl, but I do love this yarn. Supplies: White Card Blank 5" X 6 1/2" Halcraft, Papers: Stampin Up-Sending Love Specialty Series Paper, white mulberry paper, textured red circle-The Paper Co., Stamp: Autumn Leaves-scribbles hearts and stars, Ink: Stampin Up-Whisper White, Riding Hood Red, VersaMark Ink pad, CTMH-white embossing powder, Zing-Red embossing powder, Michael's-rhinestone stickers, Sakura Gelly Roll pen-clear star, Spellbinders Nestabilities-Classic Scallop Circle-Lg., Fiskars Shape cutting template-Circles1, Fiskars-2-n-1 scallop corner punch, red eyelash yarn-$ store, pop dots. Wow! The spit negative was done so flawlessly here that I had to do a double take! Just gorgeous! THanks so much for playing with Just Us gIrls this week! Perfect job on the split negative technique! So glad you tried something new...it's fun to do once in a while! Your card is lovely and I love that yarn! So pretty! Thanks for playing our JUGs challenge! Stunning and elegant, the only words needed. Thanks for joining us at Polkadoodles this week. Beautiful card! Thanks for joining in with Daring Cardmakers this week. Well done!! So great that you tried something new - and did it so well - hurdles are just there to make us THINK we can't do it - but you proved you can! Thanks so much for supporting Just Us Girls and for playing along with our challenge. Hope to see you again next week. I had to look twice to see the split image! FAB card! Never heard of this technique, will have to look it up. You've made a lovely romantic card. Thanks for joining in at Polkadoodles this week. very eye catching card , thanks for joining us at polkadoodles this week. Great card and fab colours! Thanks for entering the Polkadoodle Challenge - hope you can join us again next week! Really lovely work. 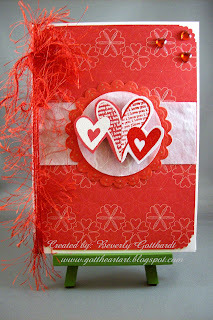 Thanks for joining in with the Polka Doodles hearts and flowers challenge.